Each month I will describe sights of interest in the night skies of South Carolina. These sights will be broken down into three sections; what you can see with the naked eye, with binoculars, and with a small telescope. 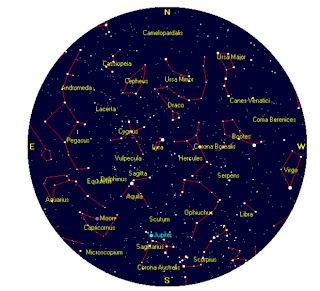 The best time to view the night sky is at and around the times when the Moon is not visible, what is known as a New Moon; which will occur twice this month on August 1st and again on Aug 30th. For August, your best viewing nights will be from August 1st through August 7th, and August 24th through August 31st. The Star chart below is set for Florence, SC on August 15th at 10 pm. 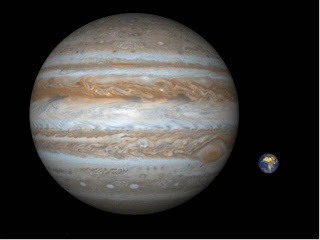 Below is an image showing the size relationship of Jupiter versus the Earth. Jupiter’s presence this summer is a great reason to take out your telescope. If you have only a small telescope, then it will be a great challenge to try to see the cloud bands on Jupiter’s “surface.” If you fail, try on several nights, and at different times. They should be visible at 25 to 50 power. Remember, as you increase the power, the planet’s disk size will increase, but you will loose clarity. The ability to see planetary detail is often based on upper atmospheric conditions, which are not obvious to our eyes. Therefore, you cannot always tell if it is a good night to view a planet until you look at it through your telescope. Another viewing hint is that good summertime viewing often can occur right after a storm front passes through. Last year I had personally viewed Jupiter on several nights through 25 power binoculars, seeing only a fuzzy disk. Then on one night the bands “jumped” into view. In addition to the surface bands, it is enjoyable to observe the moons of Jupiter. Jupiter has 63 known moons, of which only four are visible through telescopes. The four visible moons are called the Galilean moons, referring to their discovery by Galileo. The moons are named Io, Callisto, Ganymede, and Europa. 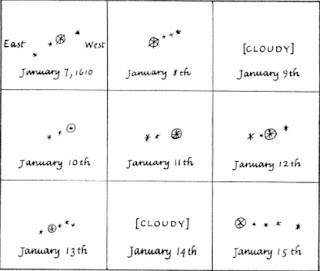 Galileo reported finding the moons in January 1610. His telescope was about 16-20 power, and quite primitive. 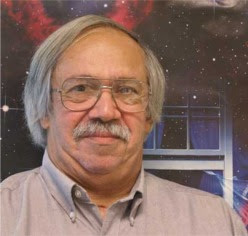 History records that another person, Simon Marius, claimed to have discovered the moons over a month before Galileo, but did not announce his observation. Therefore, Galileo who carefully recorded and reported his observations was given the credit for discovery. Below is a compilation of Galileo’s original sketches. So, if you become frustrated trying to observe the surface features of Jupiter, then try observing the Galilean moons. You can use your telescope, but all that is required is a pair of binoculars; 7-10 power is sufficient. To easily see the moons, you will have to have a steady hand, or brace the binoculars against a solid object. Most binoculars have a tripod mount, so attaching them to a simple tripod is also an option. The moons will appear as tiny points of light on either side of the planet. Remember, on any given night you will see one, two, three or four of the Galilean moons depending on how many are in front or in back of the planet. Below is an image showing a time this month when all four moons are visible, along with their names. This is a binocular image; in a telescope, the image will be reversed. The time is August 15th at 10 PM, enjoy. This month is well known for the Perseids meteor shower. The popularity is not because this is the best meteor shower, but because it occurs at a pleasant time of year to be outside late at night looking up at the sky. This shower will peak on the morning of August 12th. Look toward the east and also directly overhead. The presence of a waxing gibbous moon will interfere with your viewing late evening on August 11th, until the moon finally sets at about 1:30 am. This is actually good, because the best time to view meteor showers is between midnight and dawn. Remember, that this is the peak of the shower. In case of bad weather, you should get a good display one night before and after the 12th. Also, don’t forget that for meteor showers use your eyes only; no binoculars, and find a place to lie on your back to prevent neck strain. The Perseids can have a rate as high as 60 to 90 meteors per hour; my personal best was about 60 per hour. Watch Jupiter as it slowly moves to the west through Sagittarius. Check out the Perseids meteor shower from the 11th to the 13th. 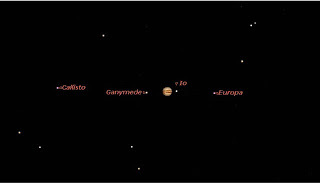 Try to observe the Galilean moons of Jupiter. Make a simple sketch each night to note the rapid movement of the moons. Also continue to wander through the Milky Way star field above and also to the right of Sagittarius. Attempt to see Jupiter’s surface bands.